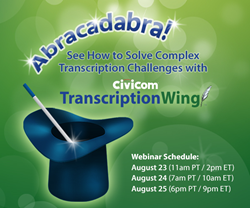 Leading global solutions provider Civicom Marketing Research Services will feature TranscriptionWing™, the leading edge transcription service of Civicom, in their upcoming webinar available several times in multiple time zones from August 23 to August 25. TranscriptionWing is a great resource for fast, accurate transcriptions with flexible options that ensure client needs are met down to the last detail. TranscriptionWing is a service of Civicom Inc., a reliable global leader in serving the marketing research community with advanced virtual communications solutions for the world's top organizations, with a strong industry presence in facilitating virtual IDIs and focus groups, online multimedia boards, and mobile research. Civicom is powered by a combination of proprietary audio conferencing technology, online meeting software, web technology tools, superior recording capabilities, and a proprietary transcription system. For more information, visit http://www.transcriptionwing.com.